Sweet potato makes for such a versatile ingredient, for salads, curries, sides and even desserts. 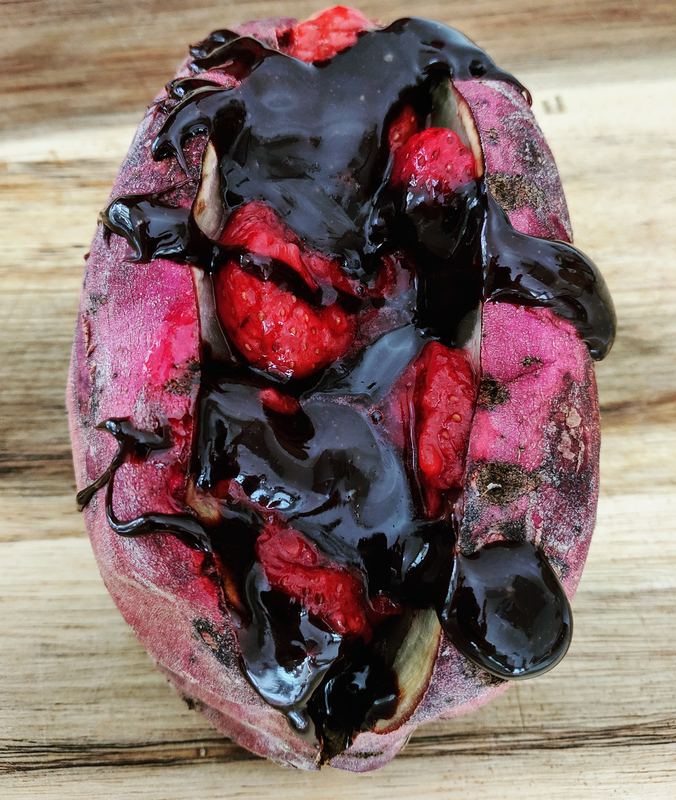 I decided to create a sweet breakfast recipe using sweet potatoes, as well as (mostly) healthy, wholesome ingredients that taste great and will satisfy your sugar cravings. You can use any sweet potato of your choice for this creation and substitute the fruit and nut butter with your favourites, but my recipe is a great, simple and tasty place to start. Enjoy for breakfast, dessert, or as a rich vegan snack! Preheat oven to approximately 200 degrees Celsius and line a baking tray with baking paper. Make a small piercing in the sweet potato with your knife, cutting down the middle slightly (do not cut all the way through). Coat sweet potatoes in butter and place in the oven for approximately 1 hour, or until the skin is thick and the inside is soft. Remove sweet potatoes and leave until cool enough to handle. Increase the openings and pull each one apart slightly, to allow for the fillings. Drizzle cashew butter on the first sweet potato, and top with banana, cinnamon and maple syrup. Drizzle chocolate spread over the second sweet potato, and top with strawberries and vanilla.